Summer time = Pick your own fruit time! 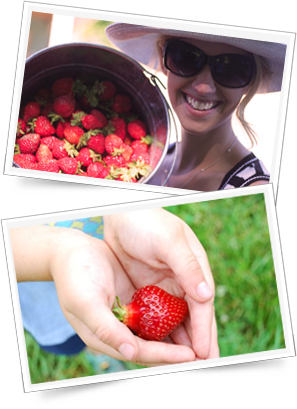 What could taste better than fresh picked juicy strawberries straight from the field? Blackcurrants or Redcurrants for making jam? Tayberries, Blackberries or Gooseberries for making desserts or just eating raw? Throughout the year we sell home grown tomatoes and cucumbers (from late May to November). Both taste and size are far superior to anything you'll ever buy in a supermarket! Try them and find out. Fresh picked fruit is so much tastier than anything bought in a shop. Fancy an outdoor day out with lots of fresh fruit, plants and good things to eat? Call us now ( 0121-705-3168 / 0121-705-1747 ) to see what is ripening at the moment - each year is a little different from every other year. We are around one mile from Solihull town centre. Widney Manor Station is only 500m from us. What fruit is available for Pick Your Own Fruit? The fruit picking season (weather depending as always!) is normally in full swing by June. Strawberries: Mid June to early July is often the peak period - think just before the tennis at Wimbledon starts! Raspberries: start shortly after the strawberries but go on longer, into August. Gooseberries: (popular for desserts) tend to be quite early, from end of May even. Blackcurrants and Redcurrant: (jam making, desserts) from June. Tayberries: are usually from early July. Blackberries: end of July, August. How does Pick Your Own Fruit work? It’s very simple. Just come down and pick! We can provide punnets and baskets. After picking we weigh the fruit and you pay for the weight picked. Roughly speaking, a large punnet of strawberries might cost about £3 to £4. When is Caldicott's Nursery open for Pick Your Own Fruit?